There are usually less personal injuries and deaths related to motor vehicle accidents in New York City during the month of January than during most other months. This January there were 17,798 traffic accidents compared to 15,977 in January 2015, 16,597 in January 2014 and 15,599. Even though motor vehicle accidents decreased from January 2014 to 2015 the number of monthly accidents has been on an increasing trend. It is the first time that the number of traffic accidents is above 17,000 for the month of January. Despite an increasing number of traffic accidents the number of injuries and deaths related to theses accidents have decreased. This is hopefully related to the introduction of various initiatives to make the streets safer launched under the NYC Vision Zero project. As motorists are driving slower and in a safer way, accidents still happen but less road users are injured or die. 3,624 people were injured in a traffic crash in New York this past January. This is more than in January 2015 (2,449) but less than in January 2014 (3,899) and in January 2013 (3,993). Globally over the last 3 years the monthly number of people injured in NYC auto accidents has been decreasing. However during the last few months, the number of injuries have been picking up again. For example, In December 2015 there were 4,519 people injured in auto accidents in NYC compared to 4,117 in December 2014 and 4,277 in December 2013. It was the first time that the number of injuries related to traffic accidents in NYC was above the trend line in December. 4,737 people were injured and 21 died in 18,862 traffic accidents in New York City in August according to recent statistics released by the NYPD. 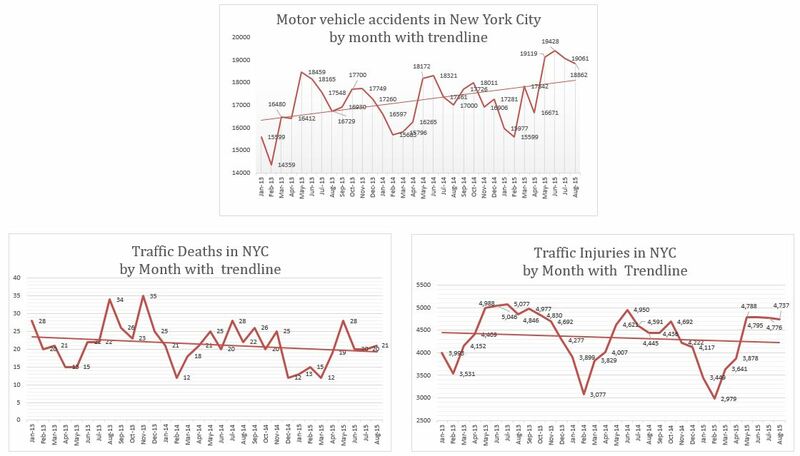 The number of motor vehicle accidents has been increasing steadily over the last three years however the number of deaths and injuries are both on a declining trend in the city (click on graphs for a larger view) which indicates that New York City streets are getting a little safer. Pedestrians are the most at risk of dying in a traffic accident in New York City. They represent more than half of the traffic fatalities. Last month 11 of them died after being struck by a vehicle compared to 6 during the previous month and 10 in August 2014. While pedestrian fatalities are on a downtrend, bicycle accident fatalities have been increasing since the beginning of 2013. Last August 3 cyclists died in accidents. 3 cyclists also died in July bringing to 11 the total number of people who died in a bicycle accident this year. During the same period of 2013 and 2014 there were respectively 7 and 15 bicycle accident fatalities. A 29 year old man and a 27 year old woman died in two separate motorcycle crashes early Saturday night in New York City. The first motorcycle accident occurred in Brooklyn around 1:15 AM. The driver of the motorcycle tried to pass a van by squeezing between the parked cars and the van on Parkside Avenue near Park Circle. He lost control of his motorcycle and died in the hospital a few hours after the crash. The second accident happened 40 minutes later in the Bronx. A 27 year old woman who was riding as a passenger on a bike driven by a 30 year old man was ejected from it after the driver lost control of the vehicle on Commerce Avenue near Newbold Avenue. The woman died and the driver suffered a broken jaw. Having ridden motorcycles for over 50 years the lack of foresight never ceases to amaze me. We all know riding bikes carries a multitude of risks from other drivers. Why compound it by riding foolishly. 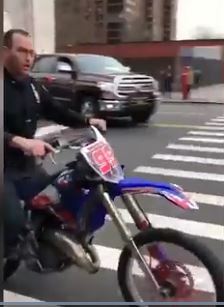 Two men suffered personal injury in a collision between a car and a motorcycle in the Bronx, NYC. The accident happened at the busy intersection of Baychester and Nereid. During the investigation the police discovered a bullet hole in the car which led them to suspect that the car driver may have ran a red light before the crash as he was fleeing the scene of a shooting that happened a few blocks away. Both the driver – who was shot – and the motorcycle driver were injured and rushed to the hospital.